Event on 20th July 2017 at 7pm till 8pm. Good morning on this fresh rainy day. Here is the mandala for tonight’s crystal mandala meditation. The mandala has been set up following the inspiration leading up to today. A goddess spiral in the middle with morganite in its belly. A beautiful gentle loving crystal for all of us children and rutile quartz in the head for inspiration and angelic guidance. Surrounded by a web. Inspired by spider’s visiting me and stories of the web that connects us. We are all interconnected and the purpose of the meditation is to be connected with an intention of land healing. This will collectively enhance the intention and ripple out those benefits to all. The collective consciousness. The corners of the copper pyramid are connected with black tourmaline a grounding, earthing, protecting crystal. The copper pyramid will magnify the mandala and draw the energy where needed. The timing is on the waning moon to help draw the energy into the earth. This theory is linked to moon planting and how the moon affects water. The moon is in Gemini at the moment which enhances gatherings, so we can work with that energy too. The elements are represented with basalt for earth in the North, amethyst for air in the East, sunstone in the South for fire and aquamarine in the West for water. These are my interpretation of the elements and yours may be different go with your culture or learning. 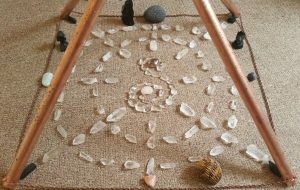 I have placed some of my crystal animals in the mandala to enhance the elements. The purpose of the mandala meditation is land healing. I work with a specific place as that is how I am guided. My discernment of this place when asking was a film billboard. Dunkirk. There is many reasons this place needing healing and its calling for assistance, so my personal meditation will be directed there. However at the time you attune or we gather in person you can be inspired to send it where ever you feel inspired. Therefore at the time of the meditation or when you can have some quiet time today, tune into the mandala and do what you need to do… send reiki, drum, chant, go on a journey, be in silence. If you want to attend in person we will gather and drum and go on a guided journey to the heart of the earth.